Lady Snowblood 1 & 2 DVD Review Housed for the first time in a handy and supremely affordable ($19 at JB!) 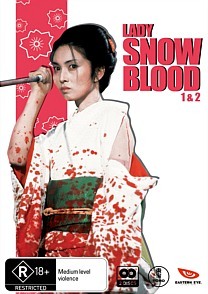 two-disc set, Lady Snowblood and its sequel Love Song of Vengeance feature one of the finest female lead performances of the 1970s, and their artful direction and potent Koike-penned screenplay lend further pathos to this bloody masterpiece. Written by Kazuo Koike of Lone Wolf and Cub fame and one of the most prominent influences on Tarantino’s Kill Bill, Lady Snowblood is a revenge flick par excellence that blends savage swordfighting, impeccable direction and a supremely intense turn from leading lady Meiko Kaji in what would become her career defining role. Kaji stars as Yuki, a young woman trained from birth for one thing only: to avenge the bloody deaths of her parents. Taken from her dying mother as a newborn and raised by a monk who trained her to eradicate all traces of human emotion, Yuki is supremely handy with a blade and takes every available opportunity to further hone her skills, usually by impaling bad guys and/or systematically lopping off their limbs. Lady Snowblood helped reinvigorate the lagging samurai genre in the early 1970s, and has proven hugely influential to this day. The Kill Bill connection is obvious – Wikipedia informs us that in addition to the theme song ‘Flower of Carnage’ it borrowed ‘plot, characters, visual motifs and settings’ from Snowblood, and Lucy Liu’s character may as well have been called Yuki – and the imagery and themes have lost none of their resonance. Kaji is stunning in her turn as the ruthless assassin devoid of all pity, and the stylised gore and stylishly crafted set pieces have proven pretty well irresistible for fans of Japanese cinema during the intervening decades. Housed for the first time in a handy and supremely affordable ($19 at JB!) two-disc set, Lady Snowblood and its sequel Love Song of Vengeance feature one of the finest female lead performances of the 1970s, and their artful direction and potent Koike-penned screenplay lend further pathos to this bloody masterpiece. The 2.35 transfer is a little soft, but given it’s 40 years old that’s pretty forgivable. Colours are vivid and there are no real grain or artefacts to speak of. The Japanese 2.0 audio, in keeping with the period, is sparse but serviceable. None, but as the Region 1 editions have all been essentially bare bones we can’t feel too left out.